The above info came from Elwin Blaine Coldiron and Amazon.com, and was edited by yours truly (contact me). Notice: Batman: The Animated Series is not Japanese animation! It is a cartoon produced in the US. However, because it has a style that is strongly influenced by anime, I have decided to include it on this site. If you're one of those hard-core anime purists who can't stand seeing a non-anime series on a site dedicated to Japanese animation, then just press the Back button on your web browser and pretend like you were never here. Like a grim angel guarding the citizens of Gotham City, Batman, the Dark Knight, watches over its citizens in the darkness of night, protecting them from the various criminals, terrorists, and predators who would scar their lives and ravage their existences. His own origins were born out of his personal tragedy, so he dedicates his life by preventing the same to others. 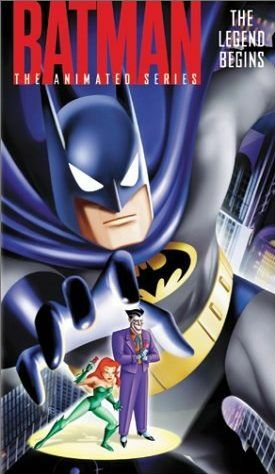 This series, which was loosely based on the 1989 Tim Burton movie and was originally first aired on FOX, focuses more on drama and action than the movie did, which profiles Batman more closely to the vision of Bob Kane's original comic book.